Learn how to tap into two spiritual power sources - prayer and confession of Scripture! Based on 2 Chronicles 7:14--15, Eckhardt's handbook is packed with petitions for repentance, confession, obedience, submission, praise, and worship. A valuable tool that will help you catch God's ear, submit to his plan, and prepare for every circumstance! 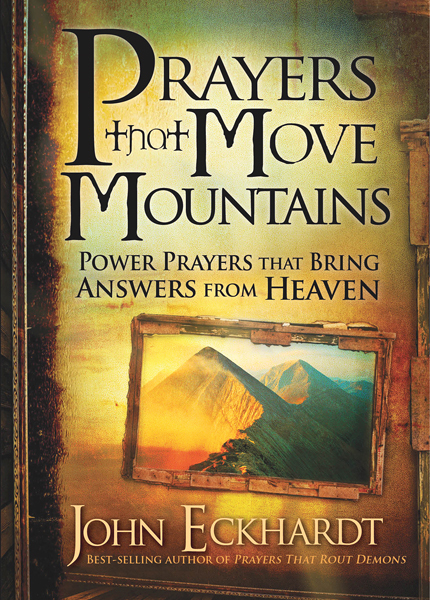 Prayers That Move Mountains by JOHN ECKHARDT was published by Strang in July 2012 and is our 5883rd best seller. The ISBN for Prayers That Move Mountains is 9781616386528. Be the first to review Prayers That Move Mountains! Got a question? No problem! Just click here to ask us about Prayers That Move Mountains.